The spacious and elegantly furnished palace, served Maharaja’s purpose of revenge, being a hundred meters higher than Shimla. The Himachal Tourism took over the reins of this grand mansion in 1971, which is now famous as the Palace Hotel. Located at a distance of 45 km from Shimla , Chail commands an excellent view of the Satluj valley with the river meandering below and green hills and mountains of both Shimla and Kasauli, as well as the snow-decked Kufri above. On a clear night, lights of this hilly spot present a connoisseur of resplendent, appearing like myriad little dots on the landscape. Each season in Chail has its charm. The pine whiffed air is cool and pleasant in the summers, providing the visitors a soothing respite, irresistibly charming is the autumn when the forest seems to have taken a dip in the stream of gold and russet. The winters are bitingly cold when the white garb spreads all over and casts a spell of quietude in this salubrious hill resort. The majestic deodars, Blue Pines, ban Oak and the rhododendron trees surround the three hills, while the palace of the Maharaja is perched on the Rajgarh Hill. 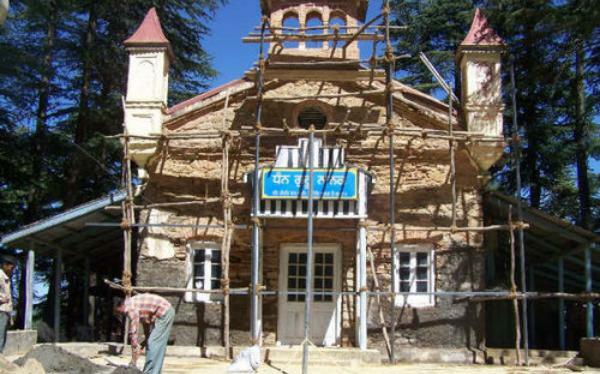 The Residency Snow View once occupied by the British is on Pandhewa Hill and the town of Chail lies on the third hill, Sidh Tibba. The challenging trekking routes for adventurous ones together with mahseer and silver fish on the Gaura River far the angler, makes the resort ultimate for the daring and enterprising ones. Well-maintained squash and tennis courts, besides Asia’s highest cricket pitch, enchant sports lovers. The ground is under the control of the Chail Military School. A walk amidst the woods leaves one spellbound. Formerly, a private game reserve of the erstwhile Maharaja of Patiala, it is now heavily degraded. Yet it contains one of the world’s most significant population of the greatly threatened cheer pheasant and European Red Deer, introduced half a century ago by the Maharaja. The lovers of wild life can also look out for barking deer, red jungle fowl, samber, ghoral, khalij, leopard, peacock, black partridge and several types of birds. Emulating a Georgian mansion, the Palace Hotel is reminiscent of the royal grandeur. Spread approximately on 75 acres, the luxurious lifestyle of the erstwhile Maharaja is brought alive in the form of spacious and well-adorned rooms with blazing fireplaces. A large graceful lawn together with pavilion and fountain adjoins the hotel. Bedecked with ornate furniture a Maharaja and Maharani suits, give a feel of royalty to the visitors. Besides deluxe and semi-deluxe rooms, the prince and princess rooms are other attractions of the palace hotel. 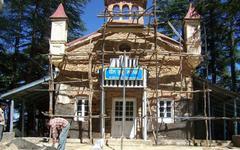 A facelift is being given to the place by the Himachal Tourism Development Corporation now. Equipped with all modern facilities, a number of cottages located in its vicinity, provide the visitors the much-needed solace from the hustle and bustle of city life.